Detailed engine data & work instructions for both petrol & diesel fuel systems. 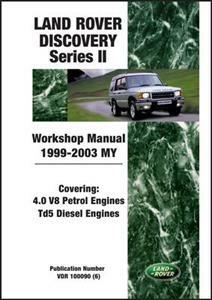 Covering 4.0 V8 petrol engines and Td5 diesel engines. A detailed guide to maintenance & repair covering of all parts of the car and engine including torque wrench settings, emission control, engine management, fuel delivery, cooling, manifolds, exhaust, clutch, automatic & manual gear box, propeller, alxes, steering, suspension, brakes, restraints, doos, exterior fittings, interior trim components, screens, seats, sunroof, panel repairs, heating, ventilation, air conditioning, wipers and washers, instruments and so much more. With 824 pages and fully illustrated.